This remarkable late panoramic landscape sketch depicts the area surrounding Het Steen, an estate outside Antwerp that Rubens acquired in 1635. 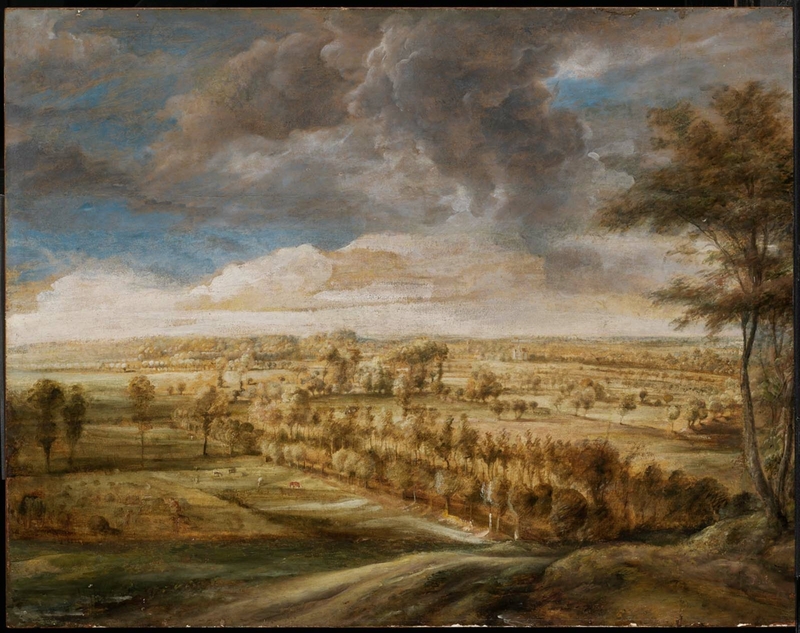 The high vantage point, framing trees at right, and diagonal recession into depth are typical of Rubens’s landscapes. A country house, perhaps the artist’s own, is visible in the distance at right. The painting once belonged to the famed connoisseur and Rubens patron Everhard Jabach (1618-1695), in whose collection it was described as unfinished. The cloud-filled sky, foliage of the trees at right, and foreground strip were added at a later date, presumably to make the painting more saleable. In his posthumous inventory of 1696, no. 152: "Paysage; sur le devant une grande allée d'arbres avec une prairie. Ce tableau n'est point encore finy; il est sur papier, collé sur bois, peint à l'huille, de Rubens." "Éverard Jabach: Collectionneur Parisien," Mémoires de la Société de l'Histoire de Paris et de l'Ile-de-France 23 (1894): p. 257. That the painting came from the Clarkson Wallis collection and was sold in 1938 is according to Gustav Glück, Die Landschaften von Peter Paul Rubens (Vienna: Schroll, 1940), p. 31, no. 24 (as "Die Allee"), where it it listed as being with Paul Bottenwieser, London. According to notes from an interview with dealer David Koetser by MFA curator W. G. Constable (January 3, 1946), the painting was "bought from the Brighton owner by Koetser, London; sold by him to Bottenwieser, and then passed to or shared by Arnold Seligmann."